It may sound intrusive but Facebook has automatically turned ON Facial Recognition feature by default for every user. Facial Recongnition technology is used by Facebook to find photos resembling your face and suggesting them automatically to friends for tagging you. With every photo uploaded on your Facebook account being checked by Facial Recognition and possibly suggested for photo tagging – there is profound privacy concern in offering. Thankfully, you can disable and turn Facial Recognition feature on Facebook. 1. After Facebook Login, goto Account > Privacy Settings option. 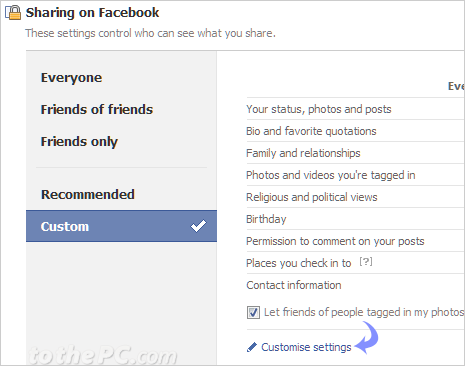 This will open Privacy Setting page for your Facebook account. 2. Then click ‘Customise settings’option in the bottom middle of the settings webpage. This will open webpage with title “Choose your privacy settings – Customise settings”. 3. Scroll down and goto “Things others share” section. Then click Edit Settings button next to “Suggest photos of me to friends – When photos look like me, suggest my name”. 4. In the pop-up screen, click to select Disabled option from the drop down menu. Then click OK to exit settings pop-up. 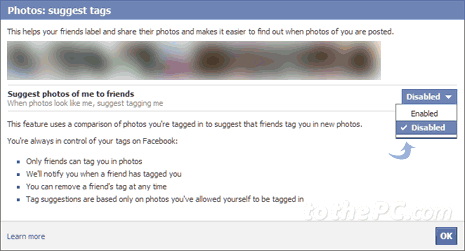 This will disable Facial Recognition for your Facebook account and your photo will not be automatically suggested for photo tagging by your friends. You can easily enable and activate Facial Recognition feature by selecting ‘enabled’ option in place of ‘disabled’. Once it is enabled, your photos will be checked using Facial Recoginition technology and photos resembling your face will be suggested automatically to friends for photo tagging.